Description: Astrophytum capricorne var. crassispinum is a popular variey of "Astrophytum capricorne" characterized by a sharp-ribbed, larger body with bright green and almost bare skin (lacks white dots), but the main distinguishing feature is in the spination. Spines are noticeably stronger, longer, larger and thicker than in the common Astrophytum capricorne. Crested form: The crested sago palm (Astrophytum capricorne var. crassispinum f. cristata) is a very rare, slow-growing and highly priced crested cactus forming odd shapes. Its stems fan out and can make a spectacular specimen. The crested form - despite to its beauty - is still very rare, pricey and sought after by collectors. Stem: Fan shaped up to 30 cm in diameter, and c. 10 cm in width. Ribs: Sharp dull-geen to bluish-green often with a reddish edge. Spines: The 6-8 (or more) spines are somewhat pectiate, striking strong and up to 8.5 cm long, flat, black to brown in the youth, later grey-chalky. They are noticeably stronger, larger and thicker than in the common Astrophytum capricorne. Yellow spined plant are occasionally found in cultivation. Flowers: The blossoms have a reddish eye as in Astrophytum capricorne var. niveum but pure sulphurous flowers are also mentioned. Propagation: Seeds, grafting or cuttings. Seeds usually will not come true to the crested shape of the parent and generate normal 8 ribbed plants. 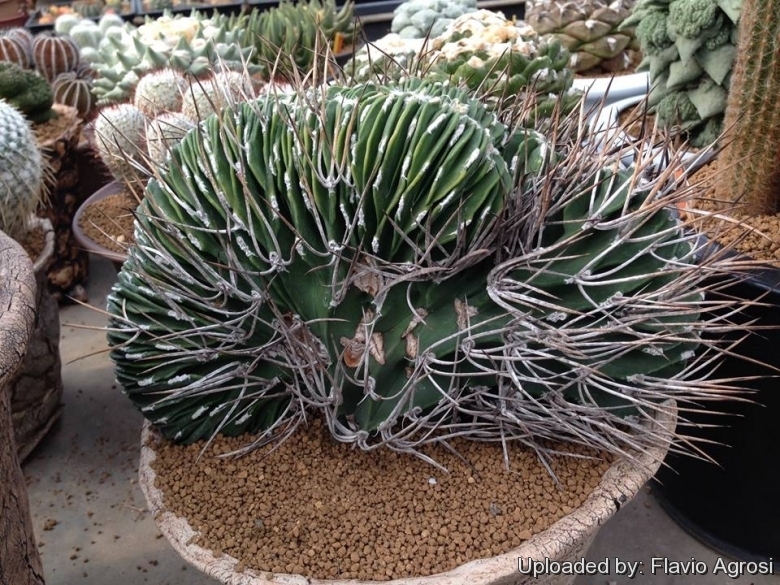 Plants are often grafted onto column-shaped cacti but proved to be able to produce their own roots if degrafted. Cuttings will take root in a minimum temperature of 20° C (but better in hot weather). Cuttings of healthy shoots can be taken in the spring and summer. Cut the stem with a sharp, sterile knife, leave the cutting in a warm, dry place for a week or weeks (depending on how thick the cutting is) until a callus forms over the wound. Once the callus forms, the cutting may be inserted in a container filled with firmed cactus potting mix topped with a surface layer of coarse grit. They should be placed in the coarse grit only; this prevents the cut end from becoming too wet and allows the roots to penetrate the rich compost underneath. The cuttings should root in 2 to 6 weeks. Large crested piece must be placed on the soil surface without burying the plant base down in the soil.